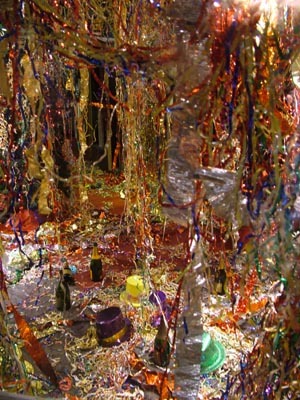 January 1 - Happy New Year! 2009 has to be better than 2008 with regards to the economy. That is the official Jim forecast. 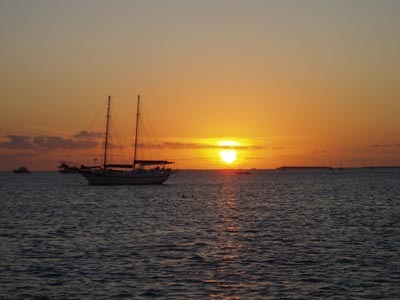 As we sit here this morning after a wonderful evening in Key West with friends, I am still wondering where we will be for the summer. We have so many options and would really like to get to New York and Boston. However, we may stop in South Carolina and hole up with the possibility of working for a friend building some decks. I guess we will just have to see what happens over the next four months to determine what we will actually do. One of the wonderful things about our life is we don't have to know and the only thing that will happen if we don't move forward with one plan is we will accomplish another. Last night was a great evening for us. 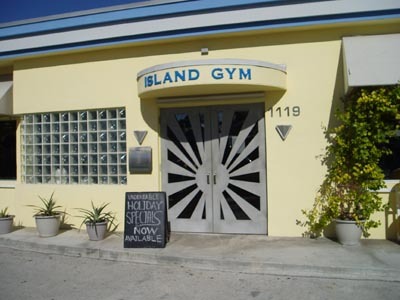 It all started at about noon with a call from some friends up the Keys. They were going to be in town so we arranged to meet at Dante's at about 4:30. It will be great reuniting with Frank and Vinie again. 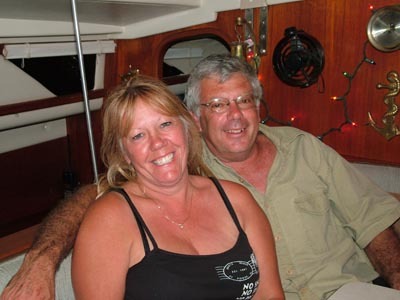 Then at 3:30 in the afternoon, we got a call from Mike and Liz on Wonderer. You might remember them. We met in the Bahamas last year and now that they are back on their boat, they have been working their way south to get down to the Keys. Guess what, they made it to Key West just in time for New Years. After explaining our plans, we stopped by their boat and gave them directions to the dinghy dock and Dante's. This was setting up to be a great night. We arrived at Dante's and Jimmy and Kip were already there having fun while Jo and Lauren were working. This is just like old home week. Music was flowing and so was the conversation as everyone showed up. We decided to eat dinner there and then take a walk down to Duval where all of the action is. As we were waking, Deb let us know here back was giving her a very bad time so we slowed down. 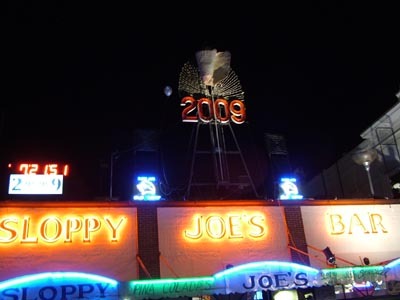 Ultimately we made it up to Sloppy Joe's where they will be dropping the Conch shell at midnight. There is also the drag queen drop in a red slipper up the street and back down at the water of course there is the requisite lowering of the winch from the mast of a schooner. 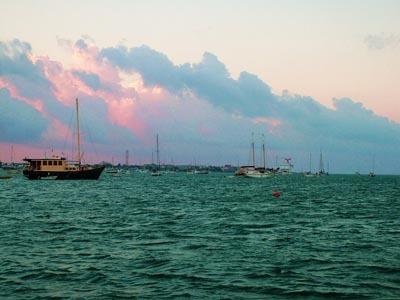 Don't you just love Key West. On New Years Eve, people walk up and down Duval. Although at seven, the crowds aren't as thick as they will get as it gets later. 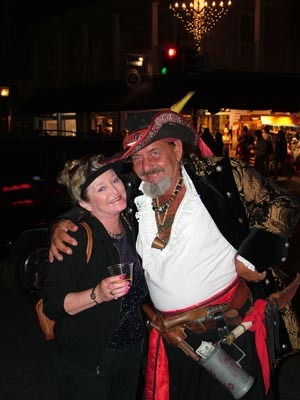 We managed to get a picture of Deb with the local pirate. This guy gets out of his dinghy every day at about 10 am and walks on his peg leg down to Duval in costume so tourists can pose with him and give him a tip. We stopped by Caroline's to say hi to a couple of people and show Mike and Liz the best hangouts. While there, we caught the picture you see to the lower right of one of the people that was ready to celebrate in full costume tonight. Deb's back got a rest and we then walked up towards Fast Buck Freddy's. 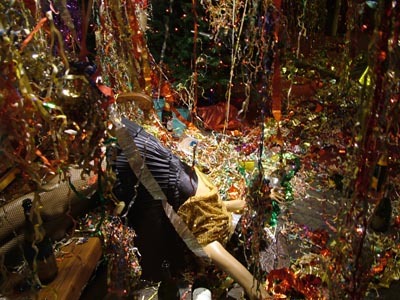 They always have quite a bit of fun decorating for New Years as you can see from the sign and pictures below. However, Deb's back was "killing her" again so we decided to call it a very early night and hobble back to our boat. We said good night to Mike and Liz giving them directions back even though it is really hard to get too lost on this rock they call an island. Deb and I walked very slowly back to the dinghy and then back to the boat on a slow dinghy ride. I pulled out the medicine bag and she got a good muscle relaxor with a promise of a back rub for New Years Day along with further treatment until it is better. I'm thinking she will either milk it for all it's worth or will be going to the doctor soon. As I look back on 2008 I feel we have been blessed with a wonderful life, wonderful family, friends and even website readers too. Our thanks to everyone of you for being the best things in our life. 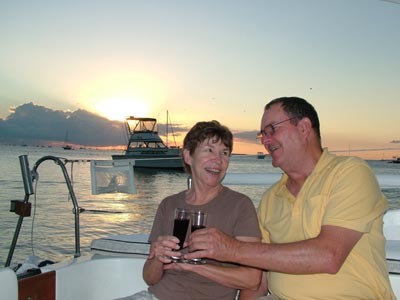 Jan 2 - Yesterday was primarily a boat day and we finished it off with a happy hour on our boat with our friends to watch sunset and exchange great stories about each other. I've talked about Mike and Liz who are now down here from Wonderer. They bought a 37 foot Formosa ketch rigged sailboat off of e-bay. They bid a nice low price and bought it sight unseen thinking they would have to refit the entire boat and put a new engine in too. However, when they arrived at the boat, the batteries were charged and the engine started right up. It turned out that the engine had already been replaced and only had 200 hours on it. What was left was a bunch of cleanup along with quite a bit of staining. 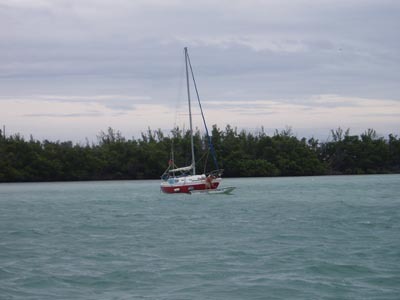 You might remember that Captain Ron was sailing around on a Formosa in the movie and it was also named Wonderer. Mike owns and runs a marina in New York but in the winter the lake freezes over completely so what should you do? Go cruising during the winter and work in the summer. Meet John. John retired as a commercial pilot and flew for Emerson. We learned that John was from St. Louis and we ended up knowing several people at Emerson who were executives. I always enjoy meeting people who are pilots who now sail. It seems they have the same cautious outlook as we do with regards to making passages. In addition, it also seems they maintain their boats in such a way that they are ready to go verses run down. John's wife had to return to St. Louis for some unpleasant duties as an executor and won't be back for about a week and a half so we will probably be doing some more stuff with John until she gets back and they head for St. Petersburg. John and his wife have a volunteer project they are going to work on up there for about a year and then they are going to take off for the Caribbean. Deb's back is still hurting so I think she will be calling the chiropractor this morning to try and get the thing back in alignment and out of pain. Otherwise we are going to do some more boat projects and get ready for our company arriving Sunday afternoon for a couple of days. Jan 7 - Sunday evening our friends Pat and Paul arrived in Key West to spend a couple of days with us. We started out with a wonderful dinner at Dante's and then I shuttled everyone out to the boat for the evening. Of course most of our time was taken up with catching up and simply good conversation along with a few good meals we put together. We were talking about going sailing on Monday but they convinced me that all they really wanted to do was hang out on the boat. Paul took the dinghy out early and surveyed the anchorage since we were in about the same place as he had anchored years ago. We were also watching a police boat in what looked like a search so that provided some entertainment too. However, after lunch we saw that same police boat approach every boat to the north of us. Then it went to the boat just one boat north and talk to A. J. whom we know. So, off I went in the dinghy to talk to A. J. What I learned was there was a new restricted area that has been created and everyone anchored in the Fleming Key area must move. However, I didn't see a chart or the information so the information was really second hand. I wanted facts. I've found that I don't get too frustrated except for the time when I don't have the facts. So the next process was to pick up the phone and call the police. Makes sense doesn't it. I called the Key West police who transferred me to the marine division and they told me it wasn't them. They gave me the sheriff's department and they told me it wasn't them. I call the port authority and they said it wasn't them. I called the Navy and they said it wasn't them. Great, it's an imposter and besides they didn't come to our boat so we must be ok. 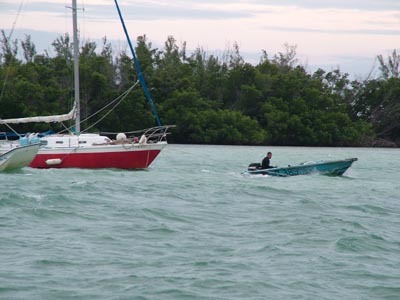 I then called the Key West Marine police back and got a Captain and explained it again. When I told him the boat was gray, he said "that's a navy boat and I'll get you the right number to call." He did and I called and left a message. Fortunately, the Lieutenant called me back on Tuesday morning. He said his boat would be back in the area that morning. We waited and didn't see the boat. 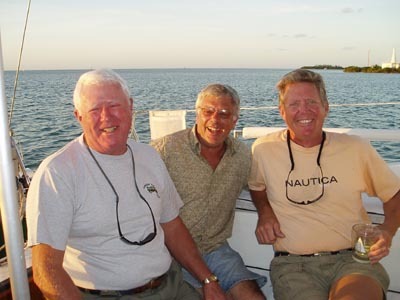 I then took Pat and Paul back to the dock and we had a wonderful breakfast before they left for their six hour drive back to Okeechobee Then I stopped by and filled the dinghy with fuel and continued the search for a new place to anchor, a project Paul and I had started the afternoon before. I returned to the boat at about 10:30 and then saw the police boat return to the area. I waited patiently while he was to come to our boat. One boat away, he was met by a dinghy and they drifted off talking. Now comes the real interesting part. He didn't come back. It looked like he was going back up to where he started yesterday. I finally hoped in the dinghy and went off after them. However, when I was about a hundred yards away, they went to full throttle and left out the north channel and believe me two 50 horse engines will outrun an 8 horse dinghy any day. What to do? I need information. I called the Lieutenant again and he answered. He said he would call them and tell them to return to the area and talk to me. About 30 minutes later they did return. They didn't come to the area where I was at so back in the dinghy to chase them down. This time they didn't run away. I guess those orders from above helped. I explained that I was on Freedom and they said they were sorry they left, they had another call they had to respond to. I then told them I'm an easy going guy and I knew they weren't my problem, they were the messengers, I simply wanted the right facts. They handed me a copy of the new regulations and also showed me a chart which they couldn't give me. As it turns out, the new regulations are created to provide for a "blast zone" in case they have an accident loading or unloading ammunition in and out of the bunkers on Fleming Key. They haven't had an accident since WW-II so I'm not sure if there are budget cuts and they have had to cut their safety, if they are putting in new explosives that will explode when they are near fiberglass, or if 9-11 was just an excuse to do something they have always wanted to do. Regardless, we have one week to get out. That's it, we have been evicted and are now searching for a new home. Some of the other boats were moving but many were sitting where they are currently talking, complaining, and perhaps in denial. Many of them are on moorings with many anchors down and may not even have enough anchors to move right away. However, since I looked at the map I was able to identify a place near where the navy police and I were talking that was outside the blast zone. In addition it provides some protection, because of shallow water, from the fronts that will blow out of the northwest and north. I thanked both of the men on the police boat for serving our country and went back to our boat. Once hovering in the area thus claiming it for ourselves, I changed out the ropes on the rode so I would have 200 feet for each anchor. That meant I had to drag the spares forward and then take off the safety wire from the shackles, unhook the shackles on the chain, attach the new ropes with shackles, and finally safety wire them in place. Now we just need to set the anchors and we will be good. The problem is we are going to be working in a fairly densely anchored area and in deep water. So I have to get the anchors set just right to provide for spacing between boats. In the end, it took me three different times working with both anchors to get everything looking just right. I have my danforth set 200 feet to the south and had to use the dinghy to take the Rocna out 150 feet to the north. Then we set the Rocna and bring both lines forward to attach to the ring at the bottom of my mooring chain. (That is an 8 foot chain with a ball on top, shackles for the lines that attach to the boat, then a swivel, chain, shackle attaching the ring for the lines to attach to.) Ok, after anchors were set, I then was able to move Freedom where it was 150 feet from each anchor and attach that mooring system. Everything went in the water and the boat was moored properly just before the 15 knot winds arrived with the front that is starting to pass through the area. After I was finished, my friend Lee came up and asked if I was sure we were out of the restricted area and I explained where he could anchor. He moved his commercial fishing boat to the west of me which is less protected than I am and in even deeper water. However, he has big anchors and lots of chain so he was able to get his boat anchored before dark with two anchors. As he was finishing up, another boat anchored further out than Lee. The land grab is in process and he who waits, will be anchoring in horrible areas or paying 290 per month to use the city mooring field. So as I write this on Wednesday morning, all looks good. We will have the front moving to the north tonight and will be able to see if we get some protection from those shallows afterall. As you can see in the picture above right, we are further from Key West. Also, that big boat in the picture on the left and the right will also have to move. Where will they go? Probably someplace temporary and the race to get my spot when we leave in three or four months. Deb and I considered lots of options and one we could have exercised because of the Gemini's shallow draft we didn't have to do. 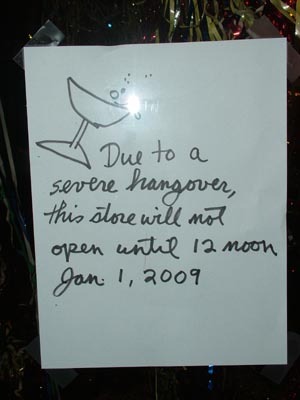 However, we may if we return to Key West again in the future. 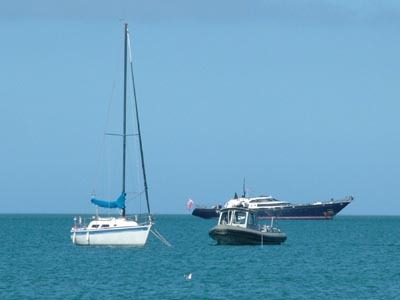 My guess is that Key West will be less visited by cruisers because of the very limited anchorage that will be available. Probably, people will be essentially forced to use the mooring field. Of course the problem with the mooring field is you really get beat up when fronts come through because of the lack of protection. I heading off in a few minutes to pick up a package which we hope is our water heater being returned and then off to post this update. I'm sure you are thinking, its about time something really interesting happened! More later. Jan 8 - As you know, we have moved and set our anchors. Yesterday we went in for lunch with our friends Mike and Liz then we went to workout and take showers. Of course Deb has a bad back so she shopped for awhile before coming by and taking a shower. Her back is improving and it is really a testament to my theory that doctors and chiropractors should cooperate. I've now got her off of the muscle relaxors and just on ibuprofen along with the obligatory ice packs and massage. The good news is that her inflammation is much better which has allowed me to adjust her lower back and it is getting much better each time we get it into alignment. No, I'm not a chiropractor but I've been to them for many years and it just so happened our last great one gave me some instruction on the lower back before we went cruising. 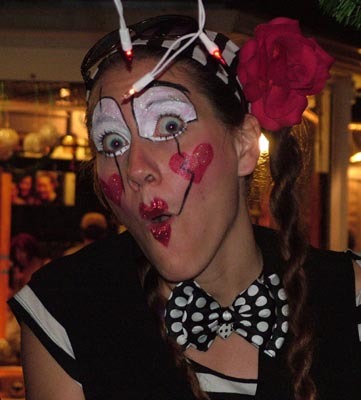 Fortunately I know enough to know when I can do it verses we need X-rays and a real professional. The good news is we are making progress. On a separate back note, mine, I was doing leg lifts at the gym last Saturday and my back self adjusted. This was a BIG DEAL. I have been suffering from back pain from a blown out disc for 3 years now. The biggest help was my chiropractor but we thought it was simply maintenance pain taking 3 ibuprofen every morning to get going and 2 in the evening if needed. The good news is that the shooting pain from that disc is gone. All I have left are some muscle issues and they are getting better as I build the muscles in my lower back and ab's. It is entirely possible I will be pain free in the next two months. Can you say Hooray? We then came back to the boat after seeing Mike and Liz again for a short time before what I thought would be a good rain and the wind shift. You always want to be on you boat during a wind shift on untested anchors. The forecast said it was only going to be 15 or so knots but as a squall developed you can see to the left it was more showing 30 knots. 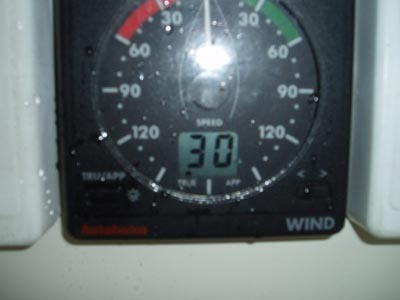 We were in a sustained 25-30 knot wind (34.5 mph for all you non-nautical types) for about 45 minutes and then it slowed to a minor 18-22 so I could go off of anchor watch and enjoy the evening in the rain. 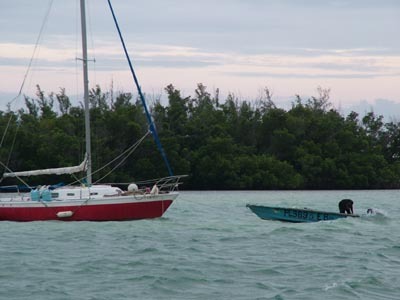 We are now confident in our new anchorage and the good news is that there are less waves here than there were in our old anchorage when a front goes through. So, that means we are happy but already know we will not have a place to anchor next time we come this way in a year or two. I'm still not sure what we will do then but perhaps that shallow spot will be the place we head for. I did get the water heater yesterday and installed this morning. The good news is that it works! I'll write more about that in the next few days because I want to give them the appropriate positive customer service spot on this site. Jan 11 - Time flys when you are having fun and are with people you enjoy. On Friday, Deb and I went to the Gym. I had worked out and Deb did a few stretches then got a long shower. Her back is getting better each day and mine is doing wonderfully. On our way back in the dinghy we saw that our friends on Skipper had arrived. We stopped by their Gemini to say "hi" and to invite them to happy hour that evening with our friends Mike and Liz whom they also know. Since it is Friday, Randy Mac is playing at Dante's and of course we love music so you know we will be there. 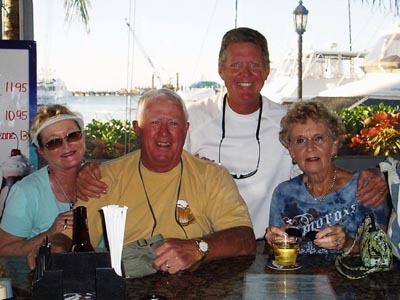 Shortly after we had arrived, Larry and Joyce from Skipper found the place and we had fun catching up on the route they had used to come down from Naples or should I say Goodland where they keep their boat. It wasn't too much later when Mike and Liz arrived and this was the first time they've seen Larry and Joyce since the Bahamas last year. I know I've talked about it before but our new home town called cruising city is really a very small town. In almost any anchorage we now have the opportunity to see a boat we've seen in our travels or to meet people that we have traveled with. Each time it is the same thing. Everyone is happy to see each other. We really haven't met an unhappy cruiser yet regardless of the boat they are on or their financial condition. There is just something to being out here on the water and experiencing what life has to offer. Even the storm don't seem to matter because you know the beautiful weather is just around the corner. Sorry friends up north, the weather here is wonderful with 75-78 degree days. We have our winter flip-flops on and are having a good time. What, another picture of the water heater? You might have remembered that we installed the Excel Tankless Water Heater in the marine version back in May. It worked great right up until it didn't. With a couple of emails and a phone call from their service person, it was determined I must have gotten a unit with a bad internal battery. Their supplier said they found out they received a few units with bad lithium batteries. I must have ended up with one. They tried to send me a new part but it didn't work properly so they said return the unit. I did and after they couldn't get it to work, they sent me another unit. Now that is what I call service. They were up-front with the problem, tried to create a simple in-the-field fix but in the end they replaced the unit to make sure their customer was taken care of. 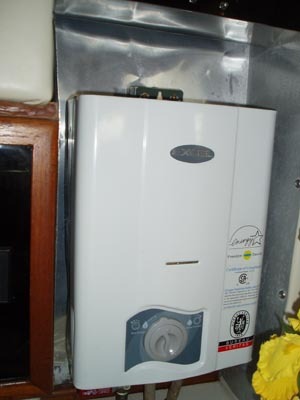 So, if you are thinking about purchasing a new water heater for your boat or your home, you should seriously consider Excel. Deb and I have been very pleased with the unit and as we found out, their customer service is also excellent. Saturday brought us another beautiful day with Deb and I heading in for grocery shopping. Of course at the end of a beautiful day comes a beautiful sunset. We suggested the night before that everyone gather on our boat so we could have more good conversation and some appetizers. Into the dinghy's and over they came to enjoy the end of another wonderful day. 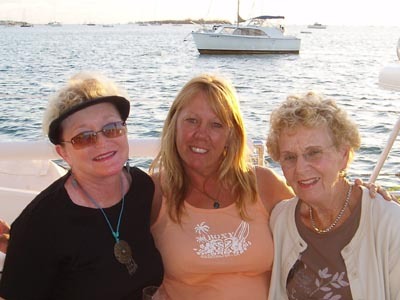 You can tell that the ladies were enjoying the evening with Deb, Liz, and Joyce on one side of the boat and the guys, Larry, Mike and of course me on the other. After sunset I cooked up some crabcakes and we also enjoyed some more appetizers in true cruiser style. Everyone brings something to eat and drink to the party. It is always fun since you get to taste new tastes and you also get to find out more about places people have been along with places you should visit too. Today, I'm heading into the gym to work out and once again get the website updated. Then it is back to the boat to change the outdrive oil and do a few other boat chores. We hope you've stayed warm up north and have had a great weekend. Jan 13 - Sunday I did get to workout and then headed back to the boat. I hauled water and also changed the outdrive oil so we are now up-to-date on all of our oil changes. For the most part, Sunday was a day off and Deb didn't do much letting her back recuperate. I really got some movement on Sunday afternoon and the results on Monday were that she is in the best shape since here injury. Monday we had invited a number of people to head out for snorkeling but we had a couple of calls Sunday and Jo had an extra shift scheduled, Lauren had to go in to work early and several others must have slept too late. It didn't matter however because Mike, Liz, Deb and I were still off for the reef to get wet. After we arrived, as you can see to the right, the first thing we loved was the water clarity. Since it has been fairly still for a few days, the water is really clear. We threw in a few crackers and in came the fish. We are on a mooring at Sand Key and also in a no-fishing zone so the fish have that figured out and I think they also know that people with boats throw food to them. We had a great lunch and a good snorkel too before starting back. 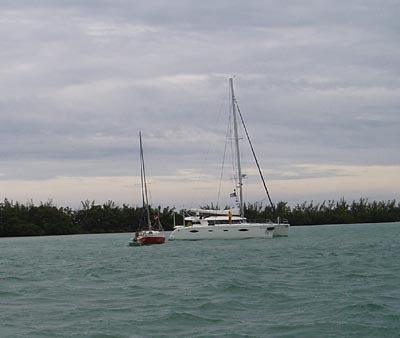 On the way out, we were able to motor sail but the wind shifted a bit more to the east so we had to motor back to Key West. 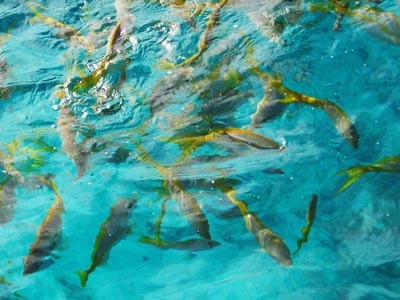 It really didn't matter since we just had a great snorkel seeing all kinds of fish. There was this grouper that I just wanted to take back and clean for lunch but again, no-fishing. Of course the barracuda that was following Mike and Liz around perhaps was thinking lunch too. 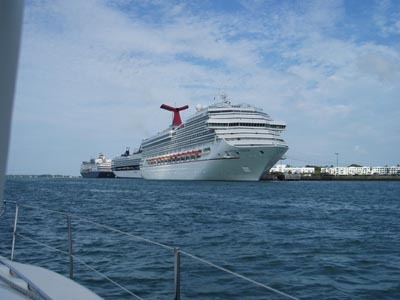 In Key West, if you are essentially a local, the one thing you don't want to do is go to Duval Street when there are three cruise ships in for the day. When you put an extra 10,000 people out on the streets, you can imagine it does get crowded. Today was a three cruise ship day and we just happened to be on the water. We thought that was a good choice. Below you can see we were fighting the current as we were coming in. The current was running at 2 knots and we were only making 4 knots over the ground as a result so the trip was slower than normal but it really didn't matter. 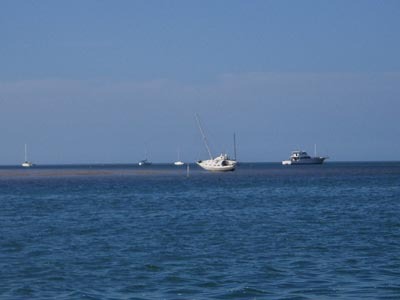 As we approached our mooring, we saw some of the lowest tides we have seen here. It is the full moon but still it always catches me with a bit of surprise. The boat you see in the picture has been aground since we were here last spring but this time you could see the land underneath the boat. Also, we saw that Alley Cat had anchored in the area. You might remember that we have seen them several times on our trip down from Kentucky. They are also on a Gemini 105 and I'll have to run by and see them Tuesday when I do my morning errands. To end the beautiful day, we continued with more conversation and enjoyed talking about all the fish we had seen underwater along with many more subjects. This morning, I'm off for my errands. I have propane to fill to ensure we have plenty on-board before the next three fronts arrive starting tonight and lasting through Sunday. In addition, I also need to exchange some videos at the library and finally get the website updated. Tonight's front is forecast to be the worst of the three with about 12 hours of 25 knot wind out of the northwest before it turns north where we will get more protection. I guess we will just have to see how it goes and decide if we will be moving for the next front or will just stay on our mooring. 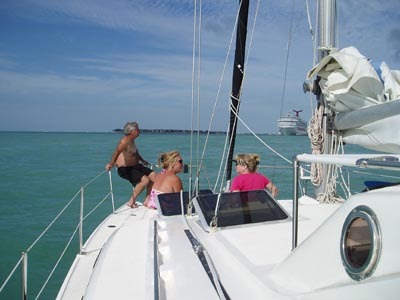 The winter fronts have finally started to make their way all the way to Key West so the fun is about to begin. 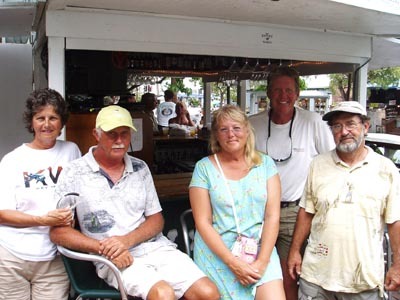 Jan 13 - 2nd entry - Kentucky Lake Reunion - For anyone from Kentucky Lake and especially Green Turtle Bay Marina, you will recognize the people to the left. Today we gathered at Caroline's and ate lunch with, left to right, Phyllis, Gerald on Alley Cat, Deb, and Tom from Hearts Desire and of course in the very background you can see Mike Liz, Deb is hidden and that is me standing up. 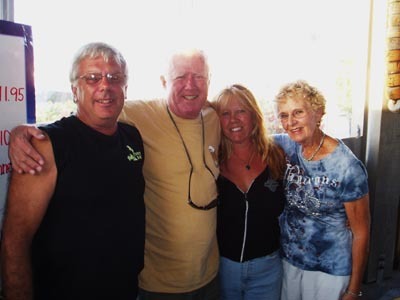 Our friends have been traveling together after Gerald and Phyllis crossed the Okeechobee and met up with Tom and Deb on the east coast of Florida. they arrived yesterday while we were off snorkeling. It was great seeing them although after lunch we headed back to the boats to await the front heading for us. 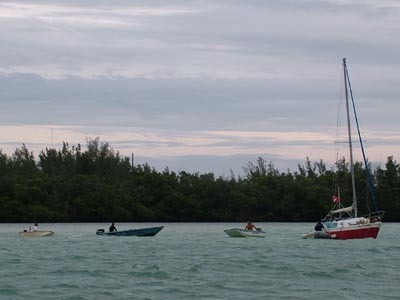 The forecast has changed and we are only expecting about 20 knot winds so that will be a pretty good evening for us as the winds turn to the north and we get protection from the point in front of us. However, on Thursday winds are supposed to get up to 25-30 again. The good news is they are supposed to be from the northeast and we will be protected. I'm still thinking that this move in anchorage has proved to have more positives than negatives.. Right now we are watching movies from the library so back to the classic movie Easy Rider. Jan 14 - Who says you can kick back and watch an entire movie? We are right about the middle of Easy Rider and I hear on the side of the boat - bam, bam, bam. It was Bud my neighbor and he was pointing to another boat, Benji, which was dragging. He said, "Jim you go get the owner, he's rowing out and I will try to get another anchor down until you get back." I understood immediately, Deb handed me the key for the boat and I was off. Now the winds were only 15 knots at this point and they were off to my side for running into the dock. I left Bud to his own work while I was on a mission to get the owner. I was almost to town when I saw a dinghy coming out under power and it was the owner. He yelled over that he borrowed a friends dinghy so I turned around to go back and see what I could do to help. In the mean time, as you can see, Bud was working away. 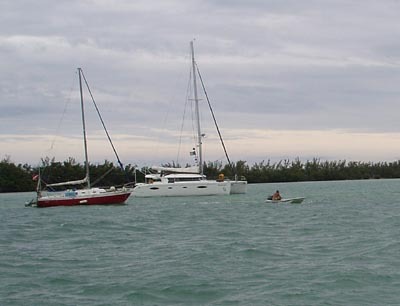 That is him on a dinghy next to the red boat Benji which is dragging. Bud is trying to get an anchor off of the deck so he can put it in his dinghy, drag it out and get an anchor set before it either hits the big cat or runs aground. Below you can see Bud got the line and then lower right you can see Benji is now anchored and Bud is standing by. While I was gone, another friend, Lee the commercial fisherman, came back from his fishing trip. 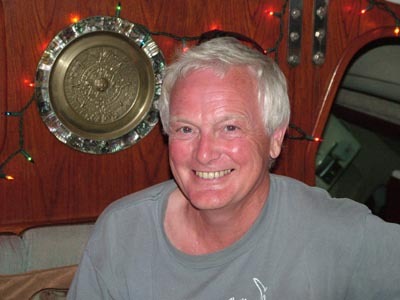 He secured his fishing boat to his mooring and got into his smaller boat and came to help. The picture to the left shows us all planning on what to do next. 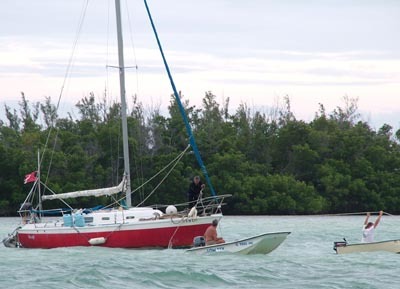 That's me to the far left in the smallest dinghy, then Lee, Bud, and the boat owner Michael next to Benji. The first plan was Lee was going to try to pick up the anchor line Bud had put out and take Benji to deeper water. That didn't work because he couldn't get a good hold of the line. So, I went in and held up the line so Lee could go under it and then secure it to his boat and I was to get out of the way. Once Lee got the line secure, I helped pull up the fouled anchor and then got out of the way while Michael pulled it on to the boat. Now we have two guys working and the other two, Bud and me, running around in dinghy's. Not too efficient so I took my dinghy back to our boat and hopped into Buds dinghy so I could either get in Lee's boat to help him, help Bud or what ended up happening was I got on Benji to help Michael. Problem was Michael was new to anchoring so I was best utilized on his deck getting things a bit more organized. At this time, Lee had him back in deep water and one anchor was out. Problem was, the other anchors didn't have enough chain or rope on them and on top of that, the rope was all twisted up so it couldn't be pulled out. So, I helped organize the line getting it untwisted while Michael put some more chain on a second anchor. Lee got this one out and we should have been able to put a third out next. Of course it wasn't that simple. We were down to the original anchor that he had out and it didn't have enough chain either. As it turned out, he had a 22 pound danforth with 10 feet of chain and 50 feet of rope. That means he only had out 60 feet of total rode and he was in 15 feet of water. With those measurements, that is less than 4 to 1 because the bow of the boat is 3 feet off of the water line, the anchor was another danforth and with the wind shifting, as it has over the last day, the anchor just won't work when wind goes in a circle as the fronts pass. 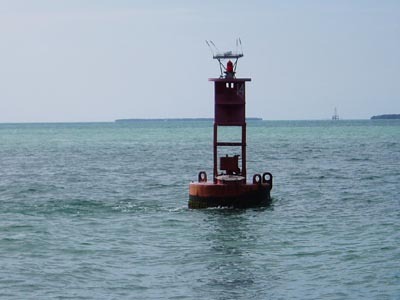 You need a minimum of two anchors for danforth's to work in a shifting wind or changing tide of which we have both in Key West. By this time, we had put Michael into Lee's boat and I was on the deck of Benji getting extra chain and a shackle so this time the anchor should hold. Michael added the 50 feet of chain to the 60 foot rode. Now we have 110 feet which is still too short but much better and all he had available. In the end, we got three anchors out and the wind was continuing to build. For most of the event it was about 15 knots but by the time I got back to our boat winds were up to 20 and later up to 25 knots. What happened to that forecast? Also, you might remember that I was a bit anxious about the first real front that came through with all of those boats that had moved. Oh well, I was drenched and had muck all over me so I stripped and headed for our shower. Then it was back to Easy Rider. Afterall, we are free and enjoying the open road or should I say seas.